Starting next week, the federal Department of Interior will begin to accept proposals to lease deep offshore ocean waters for renewable energy projects. The agency is holding public workshops in Seattle tomorrow and in Portland on Thursday to explain its rules. Correspondent Tom Banse has more. Harnessing the power of ocean waves to make electricity is all the rage among Northwest politicians and conservationists. 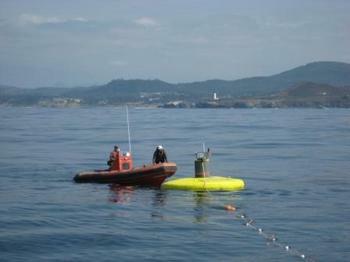 Oregon State University and the University of Washington just got a big grant to work on wave and tidal energy. Even the Presidential candidates are all for it as part of the quest for "energy independence". But the possible effects on fishing, crabbing and whales make some coastal residents uneasy. Correspondent Tom Banse reports backers of wave energy have some persuading to do. KEYSTONE HARBOR, WA - There’s a veritable gold rush underway on Northwest waters. Developers, governments, and utilities have staked claims on the most promising wave energy and tidal power sites. This has often been a case of leap first, ask questions later. Now the questions are getting a closer look. Correspondent Tom Banse reports on what it’ll take to light your lights with the power of the tides.